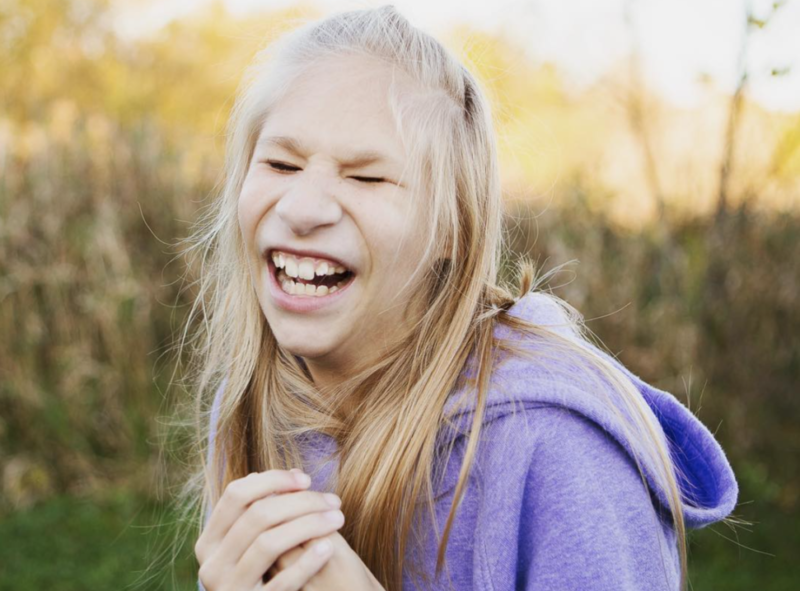 This past summer, Chris Ulmer of the popular online community Special Books by Special Kids introduced people all over the world to a new friend: a fun-loving almost-thirteen-year-old with a big smile, a sparkling sense of humor, and a contagious laugh. She was featured in a short video in which she excitedly tells Chris about what she likes to do for fun with her dog, Stella – who she says makes her the happiest – and her friends. At the end of the video, Chris begins humming a Neil Young song as he readjusts the camera, and Ruby, after lighting up with “Whatcha humming?”, joins in and repeats the tune. She sounds like a typical preteen – in many ways, she is – yet there is one thing about Ruby that makes her quite literally one in a million. She is one of only twelve people in the world diagnosed with Stromme Syndrome, a genetic condition which causes vision impairment, microcephaly, slowed growth, and intestinal issues. 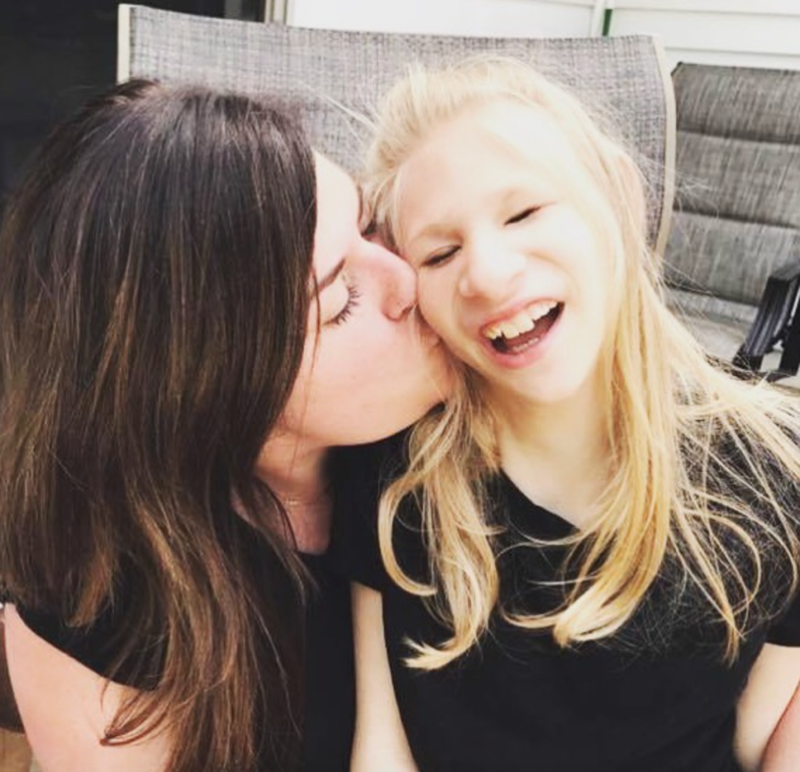 In the months since the video was released on the SBSK Instagram account, Ruby and her mother, Angie, have continued to attract attention on their own profile, @angieandruby, where Angie shares captures of Ruby’s life. 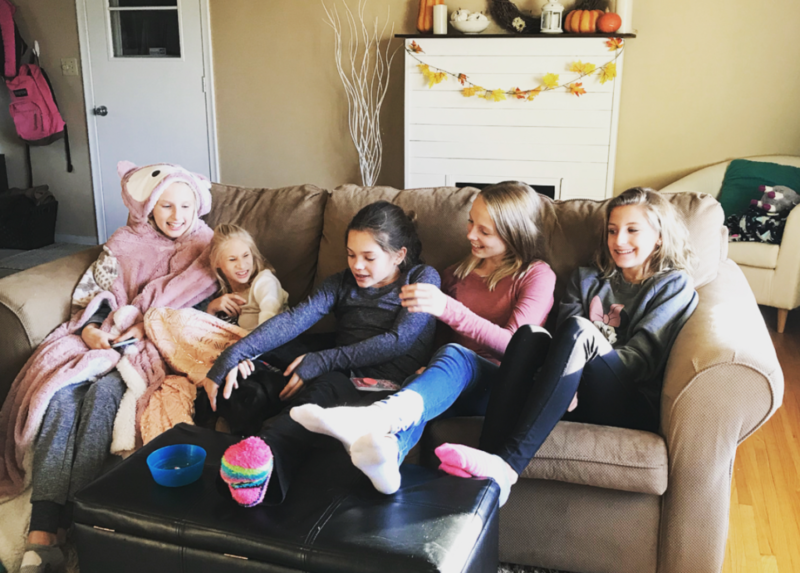 We see Ruby as she navigates everything from her doctor’s appointments, to her steps toward independence, to her days hanging out with her best friends, including her recent thirteenth birthday celebration. Ruby and friends celebrating Ruby’s thirteenth birthday party. As Angie realized that she and Ruby were no longer only a mother-daughter pair on their own journey together, but had become overnight advocates for disability awareness just by being public with their own experiences, she decided to take on her new role as if it were a mission. Angie’s style of advocacy as Ruby’s mother is simple: she sees Ruby as Ruby, surrounds herself and her daughter with people who do the same, and shares Ruby in a way that shows their audience why they should see her that way, too. She only occasionally emphasizes teachable moments; her message comes across just as powerfully in her posts which showcase Ruby as just a happy girl experiencing the joys of childhood. 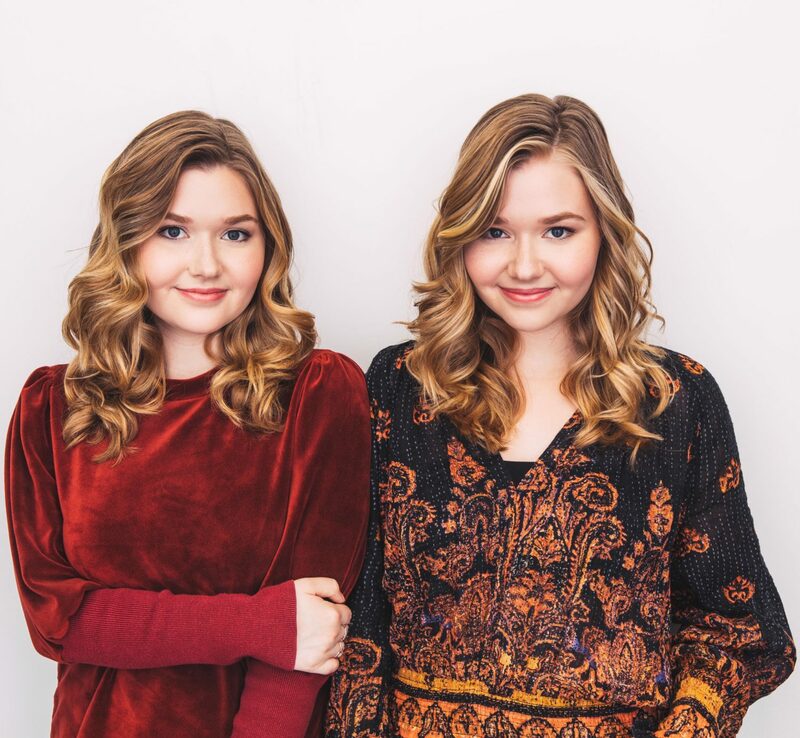 Recently, Angie reached out to her Instagram community with a goal of working on a project with the people who have supported her and Ruby. 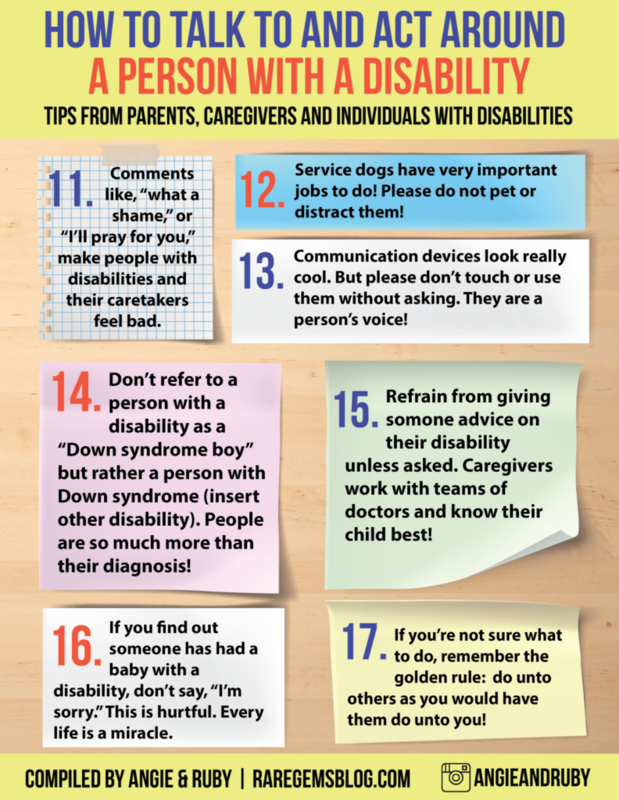 Over the next couple of weeks, Angie, Ruby, and their followers shared with each other their tips for how to speak to and act around people who have a disability, and Angie compiled a list of fifty before narrowing it down to what she feels are the 17 most important bits of advice. 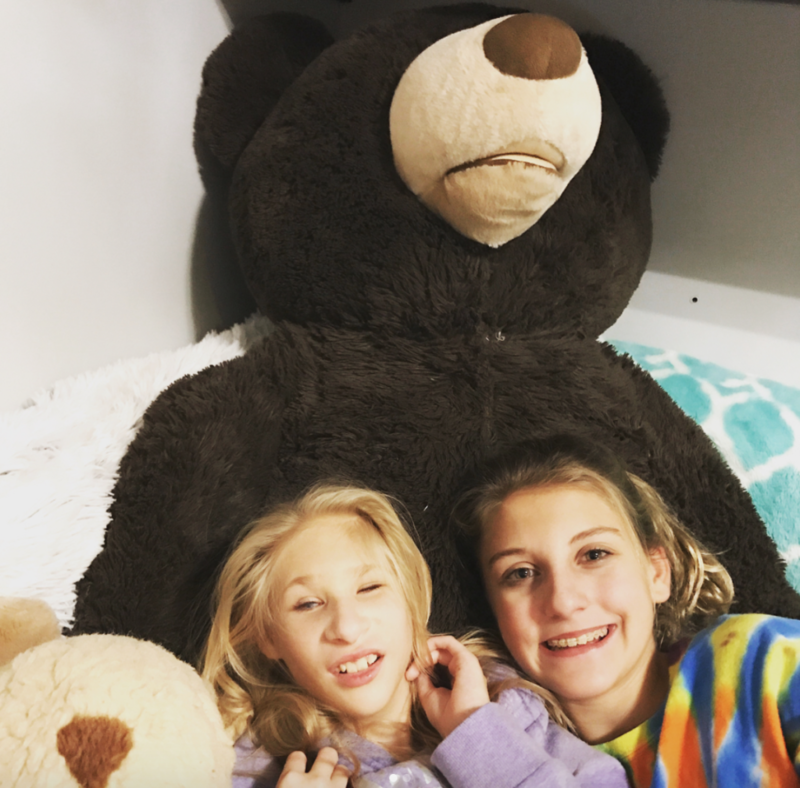 We spoke with Angie by email about what she hopes her daughter finds in her friendships as she enters her teenage years, what she would say to Ruby or anyone else who is struggling with being different, how she hopes her and Ruby’s social media account and others like it will change the way people see people with disabilities, and what Ruby has taught her about life. Cailin: Some of my favorite updates of yours are ones that show Ruby hanging out with her friends and having fun. What qualities do you hope to see in the other kids that Ruby spends time with? Angie: When Ruby makes a new friend, my first instinct is to make sure they want to be her friend for the right reasons. Ruby has always been quite popular at school (even more so now with her social media presence), so it’s my job to make sure her friends are true and not just hanging out with her for attention. The qualities we value most in her friendships are kindness, compassion, a good sense of humor and honesty. Ruby and her best friend, Rylie. Hannah: On SBSK, Chris asked Ruby what she would want somebody to say to her when they first meet her. What do you hope they say? Angie: Just like Ruby, my hope is that they would say, “Hi!” She loves meeting new people and it makes us feel like the world is an awesome place when people come up to us and engage in conversation rather than stare or talk about Ruby like she’s not there. Hannah: If you see somebody treating Ruby differently or without respect, what do you say to them? Angie: Thankfully, I have never experienced someone blatantly disrespecting Ruby in person. We’ve experienced way too much bullying online, though, and I am not afraid to block those people so they can’t access our accounts anymore. Cailin: How does Ruby respond to people who don’t treat her kindly? How much of it are you able to protect her from? Angie: Because of the nature of Ruby’s vision impairment and developmental delays, she is never alone in the community and she doesn’t go online without someone helping her. That means we are able to block almost 100 percent of the negativity from her life. I’m sure there are little things that happen at school that might frustrate her, but for the most part she has no idea that anyone would ever say something mean thing to her or about her. I think that this is an amazing gift. If Ruby were ever to experience unkind treatment, I would do my best to explain that some people hurt others because they are hurting themselves—but that it does not reflect on who Ruby is. My hope is that I never have to do that, but as she gets older, I know that I won’t be able to protect her from everything. Hannah: What words of advice do you give Ruby, or anyone else you know who may struggle with being different sometimes, when they are going through a rough time? Angie: I would tell them that their differences are what make them beautiful and unique. Imagine what the world would be like if everyone were the same? Boring! Let your brilliant light shine so that others can feel inspired to do the same! You never know who you might inspire by just being yourself. Hannah: How do you hope blogs like yours change the way people see people with disabilities? Angie: My hope is that people will see that individuals with disabilities are not destined to a sad, lonely life. With the right attitude, they can have amazing friendships, cool experiences, awesome achievements and a life full of love and happiness. I also hope to inspire parents who are walking the same journey as me to keep the faith and know they are never alone. 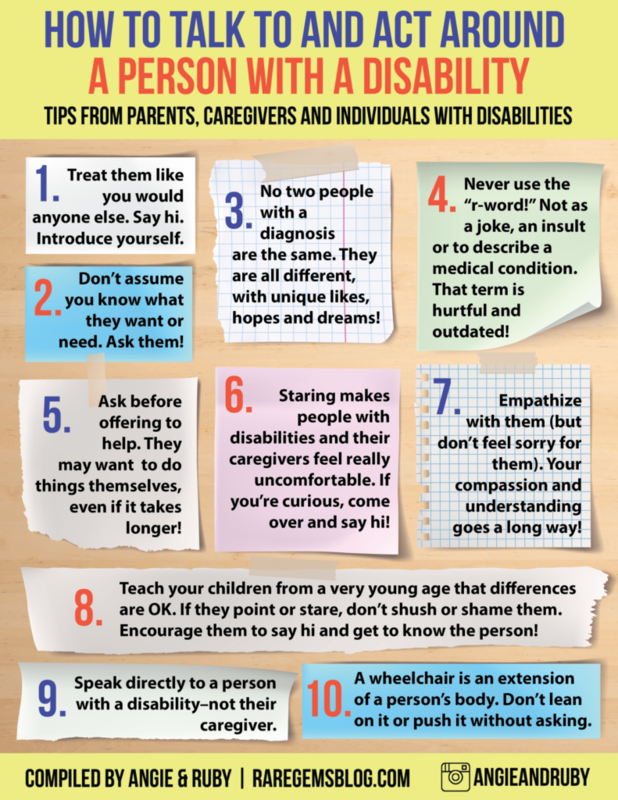 Cailin: Your list, which you made with the help of your followers on Instagram, shares tips on how to speak to and communicate with people with disabilities. If you had to call one of them the most important for people to keep in mind, which one would you choose? Angie: I think the first tip really sums up the rest of them: “Treat them like you would anyone else.” People with disabilities don’t want to feel different or special – they just want to fit in and feel like they are accepted for who they are. Hannah: Have you had a moment since Ruby became a social media sensation that made you really stop and think, “Wow, this is why it’s so important for me to keep sharing Ruby’s story”? Angie: I have these moments every single day! We receive messages on a daily basis from people who tell us that they were feeling sad, depressed or alone and Ruby made them smile or gave them hope that they can persevere through their challenging situation. Other parents walking the same path as me have told me that seeing Ruby thrive has given them renewed optimism for what their child’s future can look like. We’ve also connected with other familes whose children have been diagnosed with Stromme Syndrome, which is so incredible, because it’s so rare! This entire experience has shown me what a beautiful world we live in. It feels like an amazing dream. Cailin: We love following you and Ruby on Instagram because seeing her smile through all she’s been through is contagious! I’m sure you’ve learned a lot from her, just like she has from you. What has Ruby taught you about life? Angie: Ruby has shown me how to rise up from pain and sadness and transform it into hope and faith. She has taught me how to be patient and brave in the face of life’s unknowns. And most importantly, she has shown me how to love fiercely and without conditions. While I give Ruby love and support and a safe home, it is ME who has grown the most over the last 13 years of her life. She teaches me new lessons every single day and I am so incredibly blessed to be her momma. You can find Angie and Ruby on Instagram at @angieandruby, and on the web at www.RareGemsBlog.com.